Rock on. . HD Wallpaper and background images in the Shadow The Hedgehog club tagged: shadow. Instead of Guitar Hero let it be Guitar Shadow!!! ROCK ON SHADOW!!!!!!!!!!!!!! WOOOHOOO U ROCK!!!!!!!! Is a digital image o a Drawing???? this is more awesome than awesome can be. only 2 girl can be in it... I CALL SHADOW! Yeah ROCK MY WORLD!!!!!!!!!! !not u sonic! I knew it! Shadow does play the guitar! COOL! !I LOVE YOU GUYS!!!! !IM YOUR ULTIMATE NO.1 FAN!!!!!!! WOOT GO SHADOW U ROCK MY WORLD, MY HEART, AND MY SOUL!!!! I LUV U SHADOW!!!!!!!!!!!!! but why was sonis on there..................iiiiiiiiiiiiiiii will kill uuuuuuuuuuuuuuuuuuuu!!!!!! Sonic: ROCK ON PEOPLES AND KEEP ON LIVING!!! RAH!!! RAH!!! RAH!!! Shadow: ... *lol* nuff said. Rock on shadow, rock on. WOW Sonic and Shadow in a band COOL!!!!! ROCK ON SHADOW WOO HOO!!!!!!!! shadow has a way better guitar than sonic. SHADOW! ROCK ON THE HOLE WORLD! not you sonic! What a awsome pic!!!!!! I am saving it as my fav right now!!! Tailsica(me): *is leaning on a rock and opens one eye and glares at house where music is comeing from* what are sonic and Shadow doing? Melody: *sits up from grass a little ways off* idk sound like a song their playing on guitar hero. Sonic: *is on ard and haveing no truble at all with the nites* hey shadow how u holding up there? Sonic: we where nearly done with that song and we where going to beat the high score! Tailsica(me) *crosses arms and flicks ears* eather turn the thing down or i will destroy the x box! take out shadow and its TWICE as better! Yesh! They have guitars! Awsomness! What song are they playing and singing! Te he! Awesome! My fav pic! FOR ONCE I LIKE SONICS SMILE! HOW ASEOME CAN SHADOW BE?!?! ?ESPESIALY WHEN HE IS ROCKING!!!!!!!!!!!!!!!!! 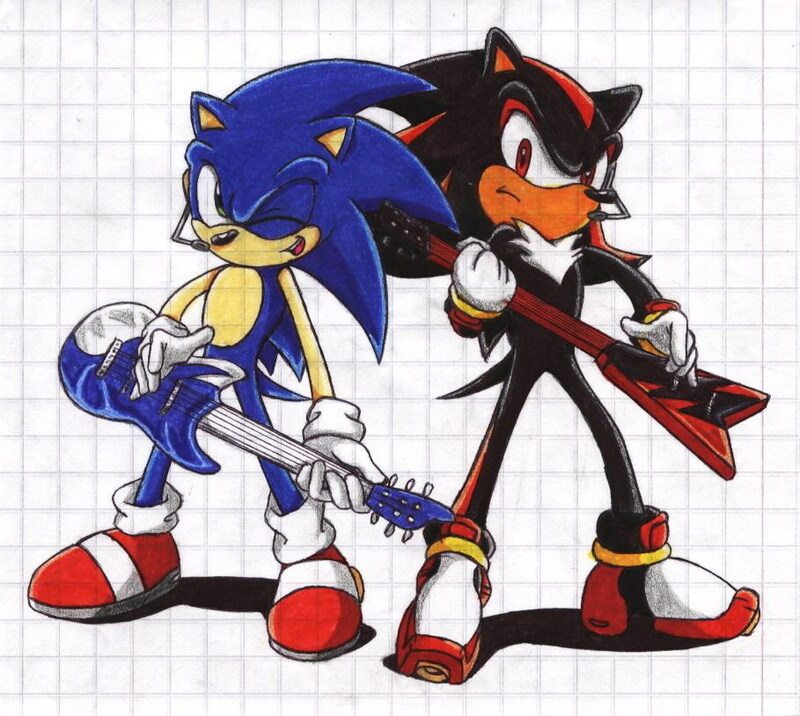 I have always been daydreaming when Shadow was always in a band with Sonic, Silver, and Knuckles. Sonic on the acoustic guitar, Silver on the electric guitar, Shadow on another electric guitar, and Knuckles on the drums. And if their was another song that needs another instrument. Another character would just go up there. This is why this is the BEST picture ever!